Whether you’re interested in dramatic mountain ranges, friendly corner cafes, or unique landscapes, Bolivia is the destination to add to the top of your list of places to travel. We’ve put together a list of ten reasons to visit Bolivia, although there are many more than just these reasons to visit this South American country. Bolivia boasts some of the highest mountains in the worlds, cities perched at high elevations, and tropical Amazon jungle, too. Be sure to give yourself plenty of time to travel through this still-relatively-unknown gem – it’s worth it! Stay in a Salt Hotel – Take time to visit the Salar de Uyuni, the largest salt flats in the world that offer a unique view and experience. The flats are covered in a thin layer of water that makes it look like you’re viewing a huge, still lake – anyone walking across the flats in front of you will look like they’re walking on water. Tayka Del Sal and Palacio del Sal reside on opposite sides of the flat; they’re just two of several hotels made from the same salt they’re built on. Soak Alongside Flamingos – Head to Laguna Colorada on Bolivia’s Altiplano (High Plain) near Uyuni for a view of the stunning red lagoon and its thousands of inhabitants: several species of flamingos. Head to one of the nearby hot springs and enjoy a soak as you take in the sights and the birds. Survive the Death Road – Enjoy this world-famous cycling route on Yungas Road. Nicknamed the Death Road, this route is a popular mountain-biking route that winds from the mountains down into the jungle, topping out at a 15,000+ foot summit and dropping down to 3,900 feet along the valley floor. Originally, it was the only road that connected La Paz and the Yungas region. Today, most traffic is now redirected down a different road, so the death factor is greatly reduced. If you’re up for riding it, you can enlist the help of an experienced guide and support vehicle in case you chicken out when you peek out over the side of the mountain and realize you can see 600 feet straight down. Soar Over La Paz in Mi Teleferico – La Paz, the seat of Bolivia’s government, sits at nearly 12,000 feet above sea level. Get a little higher and explore the city from above using Mi Teleférico, one of the world’s longest and most extensive cable car networks in the world. If you prefer to brave the traffic and walk the streets instead, there are crossing guards dressed as zebras (cebritas) teaching cars and pedestrians to coexist. Follow In Che Guevara’s Footsteps – Retrace the communist revolutionary’s final days near Vallegrande, where he was executed for his role in several countries’ revolutions. Learn about Guevara’s life and history while exploring an area of the country that receives less tourist traffic than other regions. Vallegrande is only a short drive from Santa Cruz, which is now a hub for several international flights. Venture into the Mines in Potosi – Head to one of the highest cities in the world at more than 13,000 feet in elevation to descend into the mountain where the Spanish mined much of the silver that funded their empire. A working miner will guide you through the shafts and share the legends of Cerro Rico (Rich Mountain) on his day off. Learn about the history of the mines that made Spain one of the richest countries of their time, with more than 40,000 tons of silver extracted over 200 years. Spend the night in the World’s Highest Hotel – The Guinness Book of Records lists Hotel Everest at 13,000 feet, but Tayka Del Desierto in the Siloli Desert in Potosí has that beat by about 2,000 feet. Set in the midst the desert’s red, sandy mountains, you could easily think you have woken up on Mars. 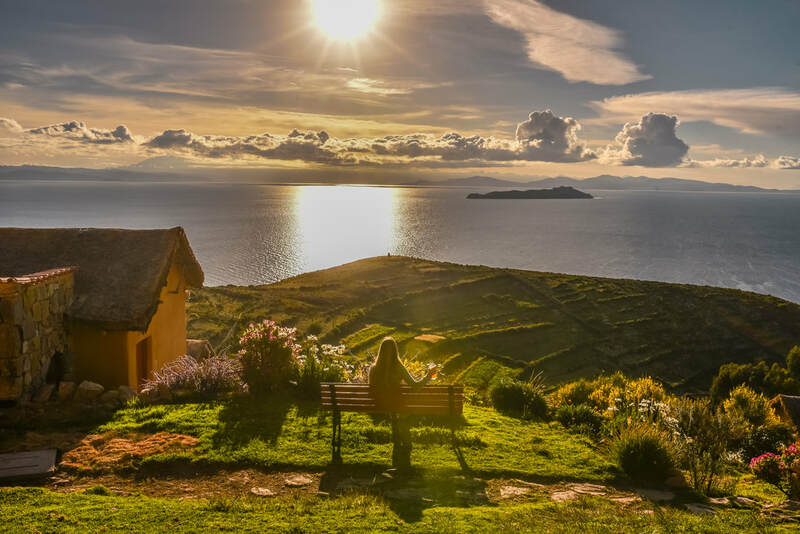 Go off-grid on Isla Del Sol – Catch a small boat to this remote island on Lake Titicaca with no cars and only solar power. You reach your comfortable ecolodge via a sloping track that passes Incan ruins, small villages and terraced cliffs. Enjoy the incredible views of sunsets over Titicaca and the sunrises over the distant Cordillera Real Mountain Range. Test Your Limits in the Cordillera Real – Trek through some of South American’s highest and most isolated mountains. Unlike many other famous alpine destinations on the continent, there are no luxury lodges or resorts for miles – the only option is to sleep under the stars. Explore nearly 100 miles of breathtaking hiking trails and climbing routes that attract enthusiasts from all over the world. Dinosaur Footprints in Sucre – Visit Cal Orcko, a cliff on the edge of Bolivia’s capital city with thousands of dinosaur footprints from at least eight separate identified species. When you’re done marveling at ancient history, head into the White City – Sucre’s nickname – to explore the beautiful parks, cafes and buildings. Left to disintegrate in the corrosive salt winds of the Altiplano, these giant trains create an eerie and fascinating destination in an otherwise deserted area outside of Uyuni, one of the most important transportation hubs in South America. After you’ve had your fill of bustling La Paz, head 10 kilometers out from downtown to this unique, “lunar” landscape, with jagged spires of rock in contrasting colors, including light brown, beige, dark violet and red. Explore the rich flora and fauna of Bolivia’s Amazon region. Keep an eye out for capybara, the largest rodent in the world that looks like a smaller, short-nosed horse; squirrel and howler monkeys; exotically colored birds with strange plumage; and the crocodile-like smiles of the caimans.